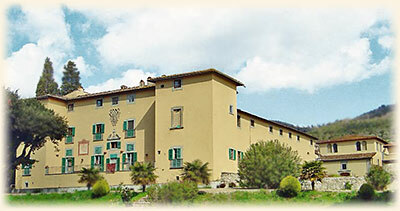 The seminary of the Institute of Christ the King is located in an ancient chateau at Gricigliano in Tuscany, Italy. Located near Florence, it is only about 170 miles from the Eternal City — Rome — and the Vatican. Named St. Phillip Neri Seminary, it is here that our priests receive the formation that prepares them to serve the Sovereign Priest. This castle is a medieval structure with four towers, a closed middle court, and a surrounding moat on three sides. In the late Renaissance the family of the Counts of Martelli changed the castle from its medieval shape into a noble summerhouse with more subtle features. Several staterooms were opened and a little theater served to entertain the Counts and their guests in the summertime. 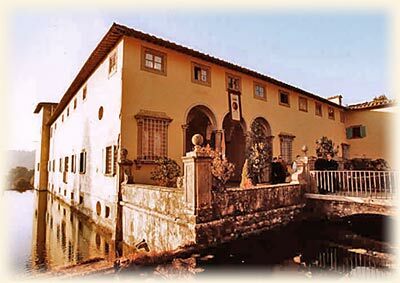 The castle is listed among the typical summer villas of Tuscany, remodeled after the style of Palladio. 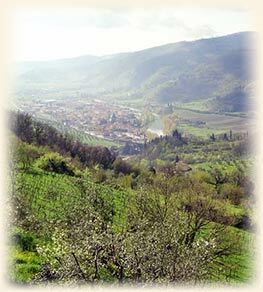 It majestically overlooks the valley of the River Sieve, which flows into the River Arno running through Florence. Because of its location in the mountains of Tuscany, the castle remains at a comfortably cool temperature, even in the hot Italian summers. The last members of the Martelli family, two elderly women who had continued the pious traditions of the family up until their death, donated the building, as well as the surrounding vineyards and olive groves of their estate, to the French Benedictine Monastery of Fontgombault. However, after twelve years, the Benedictine abbot made the decision to close the priory that had been opened in the castle because of the lack of Italian vocations. 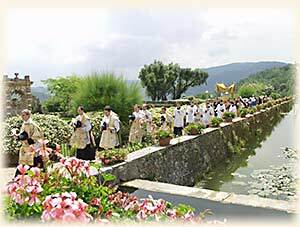 Desiring to fulfill the last will of the pious Countesses, the monks then searched for another religious community which would succeed them in celebrating the Traditional Mass. With the help of Augustinus Cardinal Mayer, then president of the Pontifical Commission Ecclesia Dei, the Institute of Christ the King entered the picture. There is certainly a big difference between a Benedictine priory set up somewhat tentatively in an old castle and the motherhouse and seminary of a Society of Apostolic Life which very soon needed more and more accommodations for seminarians and guests. It took much effort and a lot of generously donated funds to slowly change the Institute's seminary over the years into what it is now, adding as time went by new rooms, new offices, and finally even a new chapel. Still today the restoration work is not finished. The enormous roof and walls of the villa are still in need of much repair. Plans to convert a former greenhouse dating from the baroque period into the future library are still to be realized. Due to the antiquity of the buildings, as well as to the great number of young men for whom board and tuition have to be procured, our seminary somewhat resembles a barrel without a bottom, as the old saying goes, when it comes to finding the necessary funds to maintain its upkeep adequately. However, St. Joseph has always helped us. Through the generosity of our donors, the barrel somehow manages to always contain just enough to cover at least the most necessary expenses.